The Stakeholder's Chartbook: 2% GDP Growth? Pop the Corks!!! (If You Happen To Be Spanish or Greek). 2% GDP Growth? Pop the Corks!!! (If You Happen To Be Spanish or Greek). Among several issues reverberating through financial markets last week, two stood out for their relevance; one telling us where the economy has been, the other where it may be headed. On Friday the U.S. government released growth figures for the third quarter. Given that we are one-third through Q4, we’ll state the obvious which is that GDP data are lagging indicators, akin to looking through the rearview mirror. Still, the 2% growth registered in the period proves useful by adding to the narrative that this….snicker snicker….recovery is the weakest in at least a generation. The forward-looking news, which torpedoed markets, was grim corporate earnings guidance that management has telegraphed for upcoming quarters. Equities markets by definition are forward looking (the whole present value of future cash flows thing), so any change in investors’ assessment of future growth and earnings prospects merits our attention. But rather than tackle stocks at this juncture, we’ll allow earnings season to develop a bit more before divining any conclusions. Instead this week’s focus will be on recent data releases, what they say about the current state of the economy and what headwinds may be gathering. The headline number of Friday’s report is that quarterly GDP grew at a 2% annualized pace. For some perspective, quarterly growth averaged 3.2% from 1992 through 2007. After averaging a contraction of 1.7% the ensuing two years, the quarterly growth figure has registered a shade north of 2% since 2010. But the trend is not our friend; 2010’s average of 2.8% dipped to 2% in 2011 and for the first three quarters of this year it has fallen again, to 1.8%. In a welcome sign (for those who don’t think rebalancing the economy away from indulgent consumerism is a good thing), personal consumption, which accounts for a whopping 70% of economic activity, was the largest contributor to growth. Less stellar news is that nearly all the rest of the uptick was due to a rebound in government spending after eight quarters which saw this bucket be a drain on expansion. This surge was likely due to defense spending, a volatile and not-likely sustainable component. A larger wet rag came in the form of nonresidential fixed investment, a proxy for business spending on goods like computers and machinery, contracting at a 1.3% annualized rate. Exports, a rare source of positive recent news, also contracted 1.6%, making this quarter only the second period in the past two years in which trade was a drag on growth. Given the name of this forum, we are believers in the power of images, and the chart above captures the economy’s current predicament. 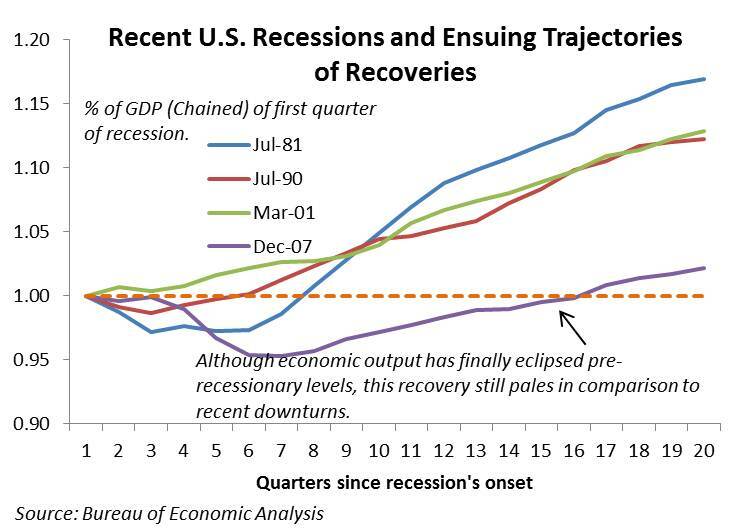 After the longest and deepest recession in generations, there has been no corresponding recovery that mirrors the trajectory of the downturn….as is often the case. Instead we are stuck with chronic 2% growth. Experts and pundits have pinned myriad descriptions on this trend, including the new normal or the Goldilocks economy. But whereas the latter infers something marginally acceptable….not too hot, not too cold….and the metaphor centers on something potentially appetizing like porridge (assuming the three bears have a microwave)….this economy is more like a bachelor pad after a weekend bender. Think, warm, flat, stale beer and cold, soggy pizza. There is not enough Excedrin to ever make those appealing. Furthermore, the country still has Uncle Freddy and Aunt Fannie passed out on the front porch, not yet knowing how/if they’ll recover from their excesses, and the irresponsible juveniles in D.C. have stolen the keys to the minivan and are careening down the road towards the fiscal cliff. Since the crisis germinated in America, hitting consumers via crashing home values and contracting credit, and businesses through credit downgrades as well as a traumatized customer base, it would be beneficial to measure the health of the recovery by directly putting one’s thumb on the appetite of domestic buyers. Fortunately such a figure exists: final sales to domestic purchasers. This figure strips out export sales as well as variations in inventory levels. As seen below, pre-crisis this figure outpaced GDP as the U.S. consumer went on a debt-fueled spending frenzy. During the recession, the plunge in final sales even outpaced the drop in GDP, partly as a consequence of stimulus-driven exports to emerging markets lifting the broader economy. 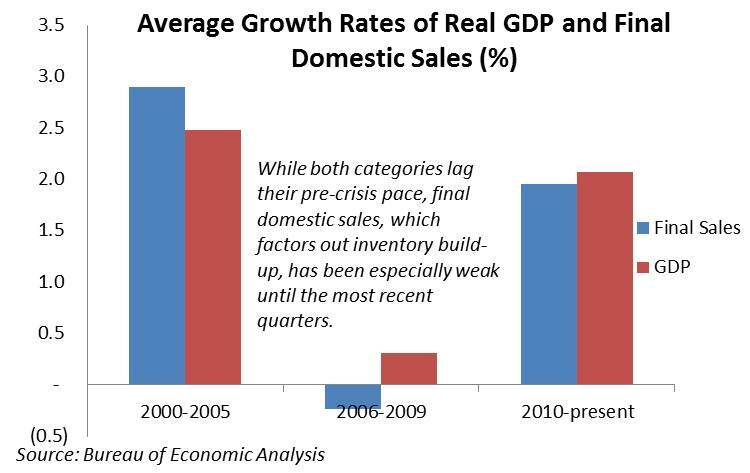 Although the growth in final sales has begun to catch up to the overall GDP rate, both remain well below their pre-crisis trend. Related to the 1.3% contraction in Q3 business spending referenced above, the recently released monthly report on durable goods sheds light on a key segment of the economy. The report provides a snapshot of the appetite for items built to last over three years. Think washing machines, cars, advanced missile systems and other everyday goods. These items are highly relevant not only because the U.S. is still a global leader in the manufacture of many of these products, but also due to them often being the result of complex manufacturing procedures. The skills needed to produce these allow workers to command a high wage, something many Americans have had difficulty in achieving over the past decades, especially when taking inflation into account. 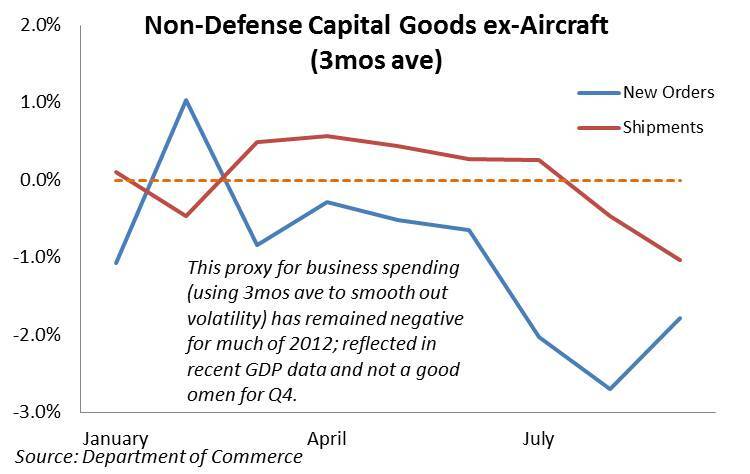 One bucket of durable goods that markets pay special attention to is nondefense capital goods excluding aircraft. This figure is considered a proxy for business spending and the new orders data is considered an indicator for industry’s future willingness to spend, especially on big ticket items. If the guys who write the fat checks for these goods are worried about economic growth, they likely will curtail such investment, especially since much of it is purchased on credit. Even with the volatile aircraft figure stripped out of this bucket it can still bounce around, so a three-month moving average (see chart below) is a good way in which to identify lasting trends. Unfortunately the trend is not pretty, with new orders being in negative territory for much of 2012. The shipments data, which corresponds to current GDP investment figures, was negative for July and August, mirroring Q3’s drop in private sector investment. Worse, the new orders data (the forward-looking component) infers that Q4 and perhaps early 2013 won’t be a garden party either. If corporate planners are hesitant to incur the cost of purchasing new machinery for their factories, the likely won’t be in any mood to bring on additional workers as well. 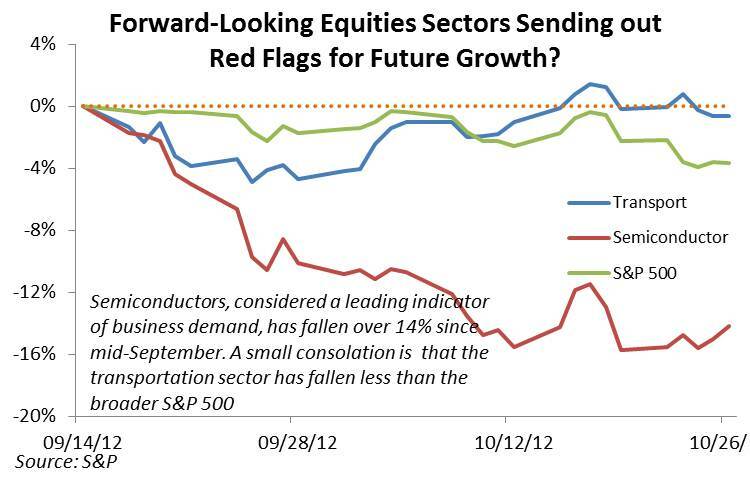 Tepid (at best) leading indicators are not the only warning signs for growth prospects. Market data from various asset classes, especially those acutely sensitive to cyclical growth, also provide cause for concern. Since mid-September, the height of the QE3 euphoria, the S&P 500 has dropped 3.7%. Worse, the semiconductor sector, often considered a barometer for future business investment, has plummeted 14.2% due to lower guidance from management. If there is any good news, it is that transportation stocks…another purported gauge of the outlook for business…have lost only 2% over the past six weeks. Other economically sensitive asset classes that rose over the late summer in anticipation of the Feds’ latest round of monetary alchemy have also cooled. Emerging market shares, as measured by the MSCI Emerging Market Index, have fallen 2.3%, which echoes the recent concern of slowing economic activity in the regions that carried much of the water for the global economy during the crisis years. 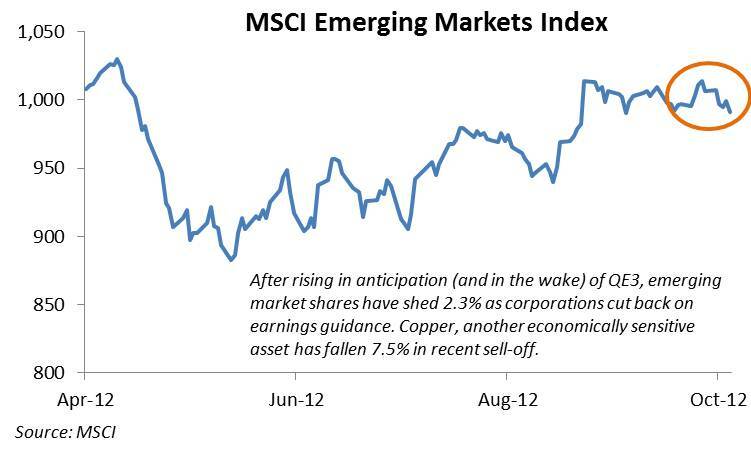 Similarly, industrial inputs such as copper and crude have also seen a correction of late. The red metal, whose broad applications across myriad products and industries make it a bellwether for economic growth, has fallen 7.5% in New York (Comex) trading. 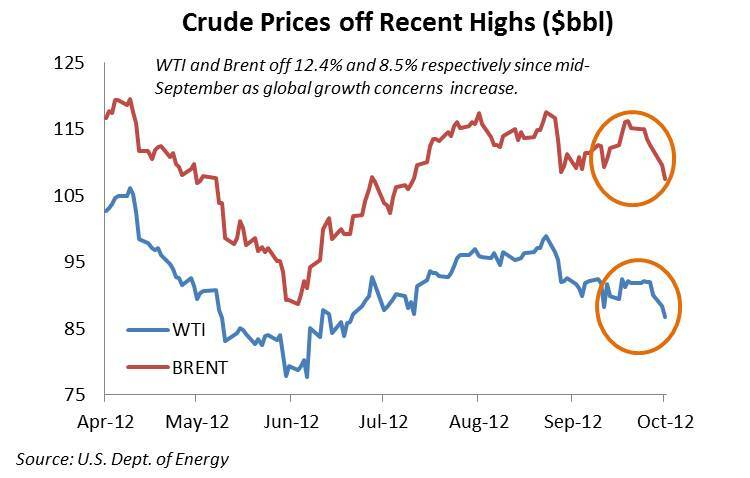 And not only has the U.S.–centric crude contract (WTI) dropped by 12.4%, the more globally sensitive BRENT contract has retreated 8.5%, despite the hornets’ nest of political risk in the Middle East not having dissipated. 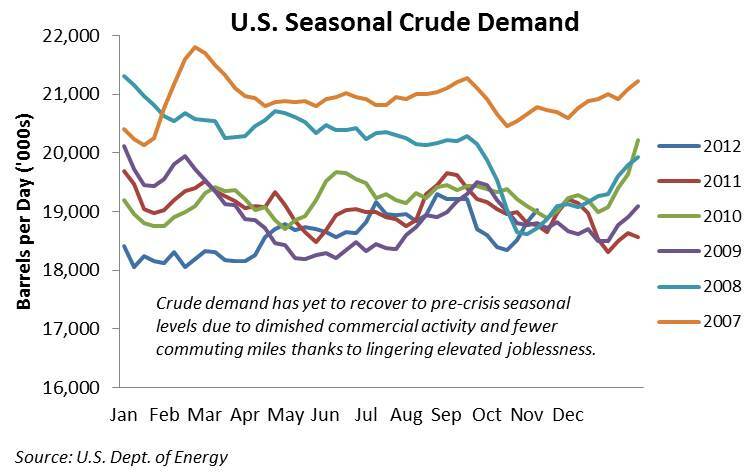 Rather than a reassessment of the risk premium placed on crude prices, the current drop, when also taking into account the signals emanating from the stock and copper markets, likely reflects not only fundamental weakness in underlying demand (see chart below), but also the concern investors have regarding uncertainty about the post-election U.S. regulatory environment and the still unresolved growth-sapping fiscal cliff. Other issues keeping market participants awake at night are slowing emerging market growth, the Eurozone’ shaky house of cards possibly finally collapsing, and subpar U.S. employment growth, which continues to rob the world of the previously reliable U.S. consumption engine. Although not on the scale of the 2008 financial crisis reaching its zenith prior to that year’s presidential election, the next week has plenty of potentially high-impact events preceding the November 6th vote. Conclusions to be drawn from earnings season will become more solidified, Friday will see the newest employment data and there is a massive storm brewing off the most concentrated population and economic hub in the country. How these and other issues play out could impact the election (either in sentiment or physical ability to turn out in the case of the hurricane). The understatement of understatements is that perhaps more than in any recent election, the outcome will determine the composition of the U.S. economy, the role of government in commerce and consequently the ability of the country to get back on a path towards robust, sustainable growth. Don’t take my word on this; both candidates repeatedly…and correctly…echo the stark choice between these visions in their round-the-clock stump speeches.